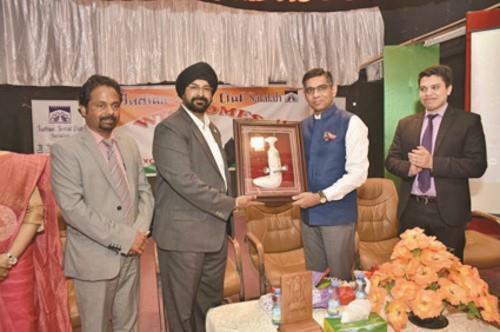 (MENAFN - Muscat Daily) Muscat- Indian Social Club (ISC), Salalah, cordially welcomed the Ambassador of India to the sultanate, H E Munu Mahawar to Salalah. The ceremony was organised by ISC, Salalah welcoming H E Mahawar for the first time to the Dhofar governorate. H E Mahawar assumed charge of the post of Ambassador of India to the sultanate on August 21. H E Mahawar addressed the Indian diaspora who were present there for the function and assured them to stand by their side during their crucial times. He further motivated the community by asking them to actively participate in the Indian Embassy's social forums and urged them to attend the Pravasi Bharat meetings. ISC, Salalah chairman, Manpreet Singh, officially welcomed H E Mahawar, the second secretary of the Indian Embassy, Sabir, and all others present during the event. He presented a bouquet and memento to the chief guest. General Secretary, Hridhya S Menon presided over the function along with management committee members, where regional and linguistic wings and private organisations had a chance to meet H E Mahawar.